Delight the ghosts and goblins on your Halloween party guest list with printable Halloween decorations. Printable decorations are fast and easy, and even better, the price tag won't give you a fright. Great decorations don't have to cost more than the ink and paper you use to print them off your computer. A few Halloween printable decorations can add a festive touch to a basic Halloween party. Download these fun decorations for your upcoming Halloween party. If you need help downloading the printables, check out these helpful tips. A banner that welcomes trick-or-treaters to your home is perfect for a kids' party and beggars' night. Wish everyone a "Happy Halloween" with a banner over the doorway as the enter or leave your party area. 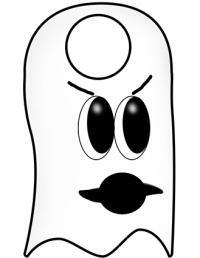 A friendly ghost is perfect for placing on kids' room doors! 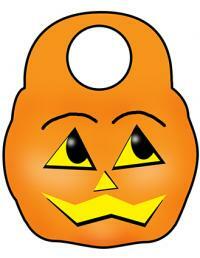 A smiling jack o'lantern is a festive addition to doors at a party with an orange and black theme. 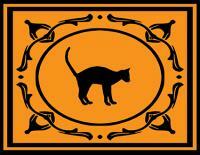 Set a spooky table with placemats featuring an orange and black cat motif. A string and a staple or tape is required for hanging the banners. Pick up black or orange twine to continue the Halloween theme. If you want to use your placemats several times, consider laminating them after printing. Then you can just wipe them clean and use again. Kids who want to get into the fun can color printed pages with a Halloween theme. Let your own kids do them before the party. Consider matting them with black, orange or green construction paper before the party to add a professional touch to the artwork that makes the pages stand out. You can also hang them as kids finish them during the party. 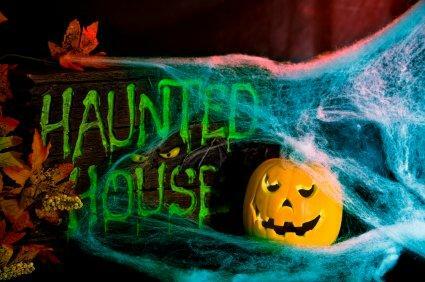 The following websites also have a great selection of Halloween decorations that you can print up for your party. Many of the decorations can be downloaded for free, so you have more money left to spend on the rest of your party! Family Fun: Family Fun has a wide array of Halloween party must-haves, from coloring sheets to t-shirt iron-ons to pumpkin carving templates. Everything here is free and family-friendly and perfect for kids' parties. Coolest Holiday Parties:The decorations for download at Coolest Holiday Parties are simple, but great for covering your black cat, pumpkin, spider, witch and Frankenstein bases. The designs here should work for any printer, and they have a few different sizes of each design from which you can choose. All Crafts.net: It's quite possible you could find every single decoration you need on this one, easy-to-navigate site. They have printable decorations that are good for kids' parties and decorations for grown-up tastes, so there's sure to be something here to set the mood perfectly for your bash. Color Mountain: Color Mountain is the kids' Halloween coloring sheet headquarters. You can download the coloring sheets on this site to get your kids in on the party decorating. Once they are colored, use them as activities at the party, or enlarge them and create great Halloween scenes for your walls. Nick Jr.: Since Nick Jr. is popular with the younger crowd, kids are sure to get a kick out of the downloadable decorations on this page. As a bonus, you'll find some great party game ideas on this site as well. Last but not least, a word of caution about downloading decorations. Make sure that you trust the source before you click on a file, and make sure your virus protection is up to date any time you download a file from the Internet. Stencils: Every Halloween-themed design conceivable - pumpkins, spiders, skeletons, ghosts, witches - you name it, you should be able to find it. You can use the stencils to create spooky homemade wall art or for unique jack-o-lantern carvings. Printout designs: Dress up plain paper plates, cups and napkins in seasonal style. This can be a great way to save money as you don't have to spend extra for the pre-printed versions that might go to waste anyway. Halloween-themed coloring sheets: Let the kids create their own party decorations or keep your young party guests entertained. Large printouts of Halloween characters: Use them as posters or cut out and tape to cardboard to create life-size ghouls. With a little bit of research, you're bound to find the perfect decorations for your Halloween gathering. The only limitation you might run into is your printer. Depending on the size and quality of your printer, there may be some decorations that you can't effectively print. One way around this is to download the file to a disc or jump drive and head to you local printer to have a professional print up it up for you. If you plan on printing them yourself, be sure to have the right type of paper and plenty of ink. Many decorations may require both color and black ink.